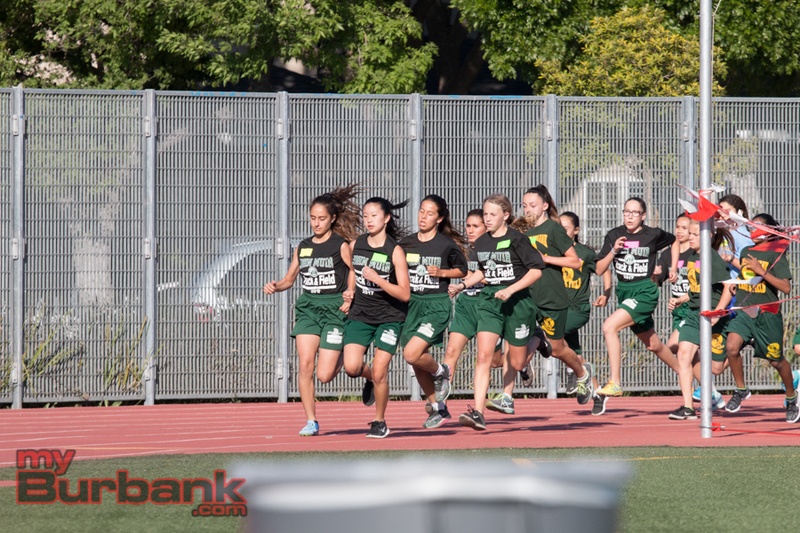 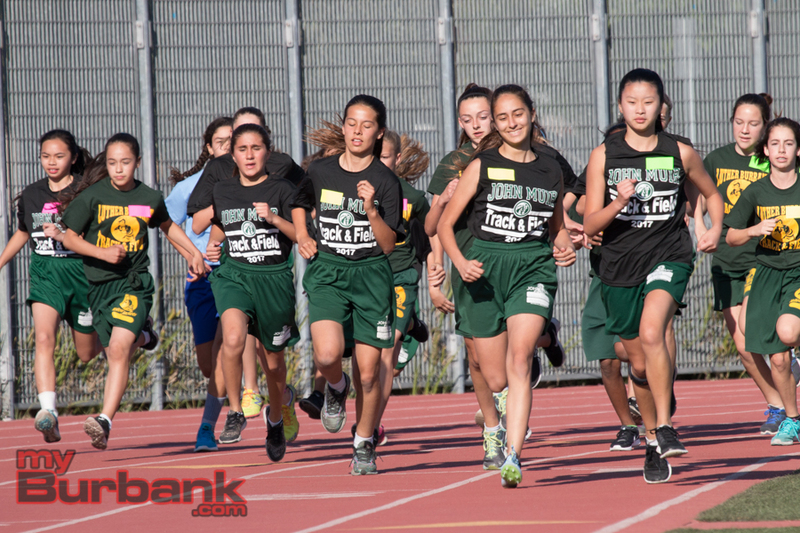 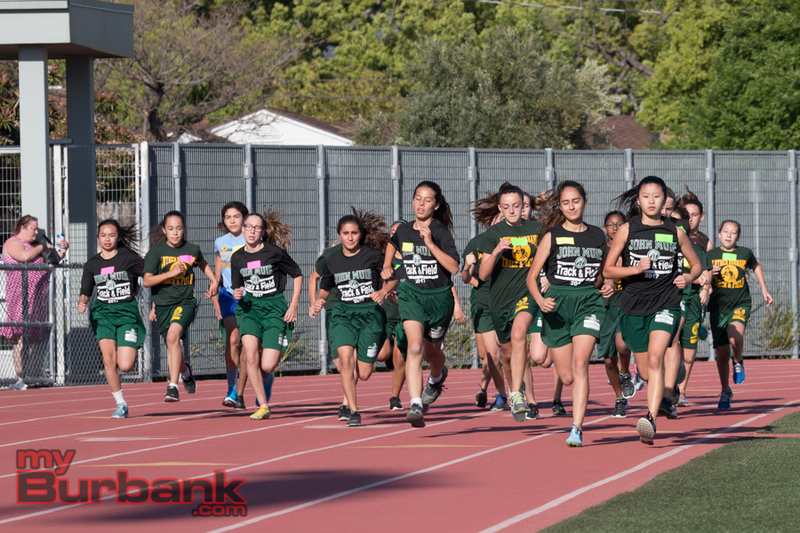 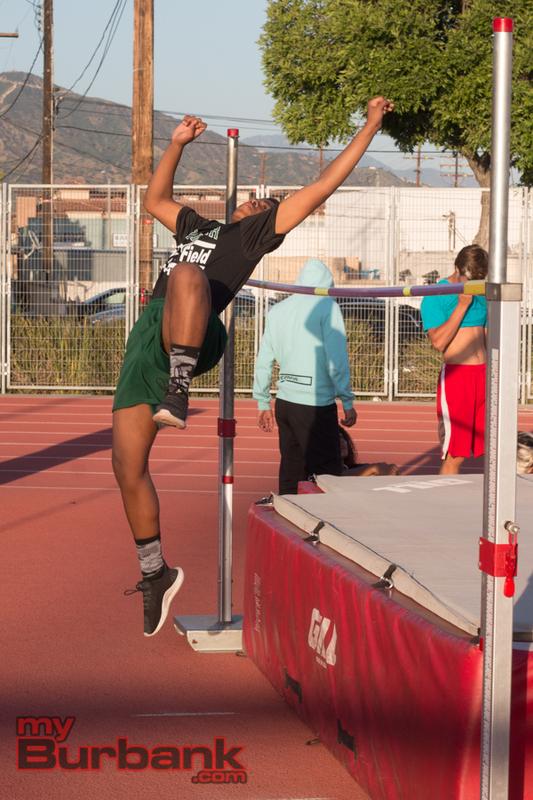 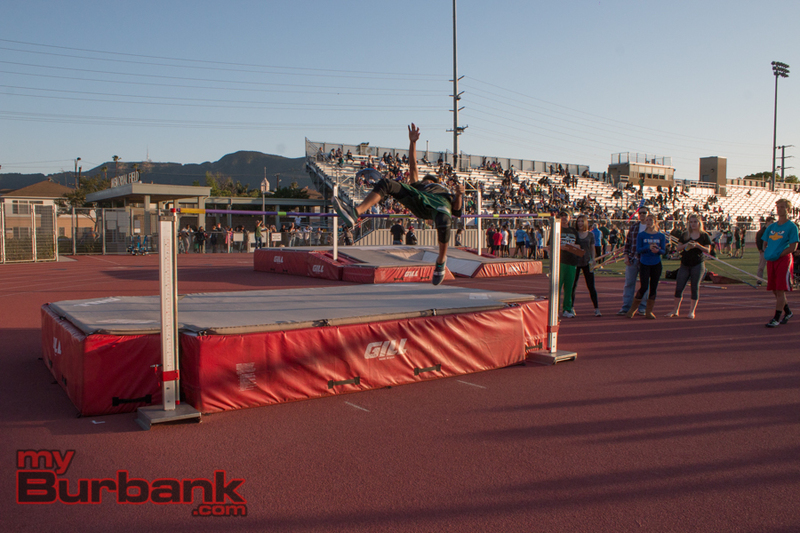 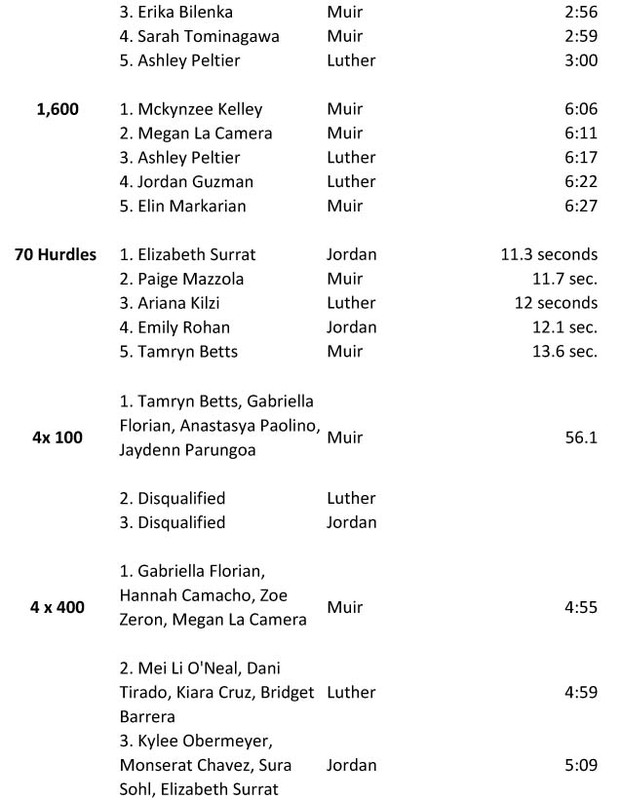 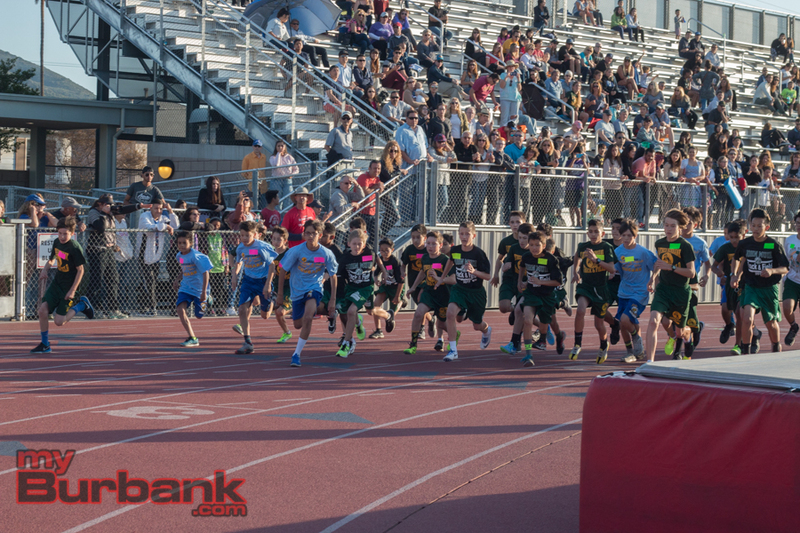 The 2017 Middle School Track meet certainly had some stars that have surnames that are no strangers to Burbank. 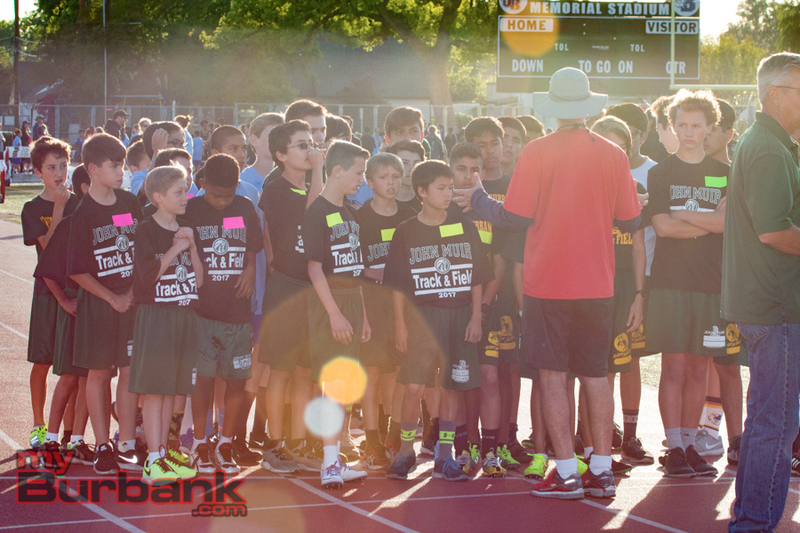 Some of the top performers Friday night at Memorial Field have long family ties to the city. 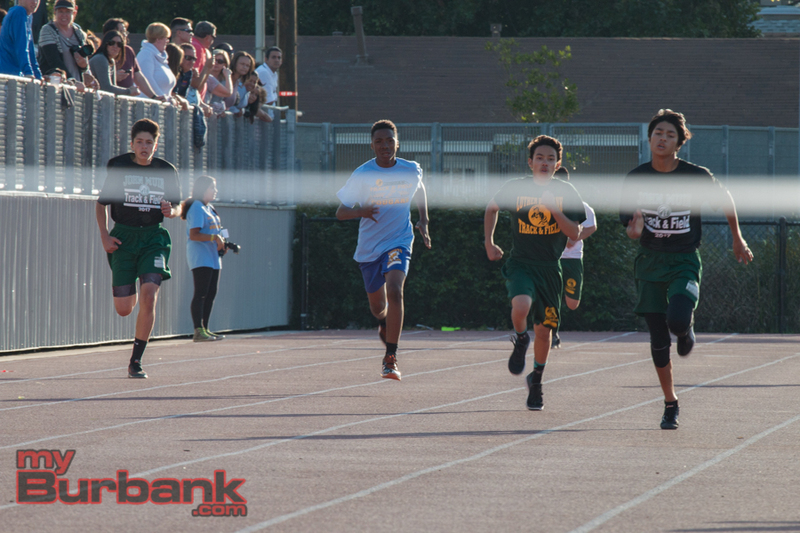 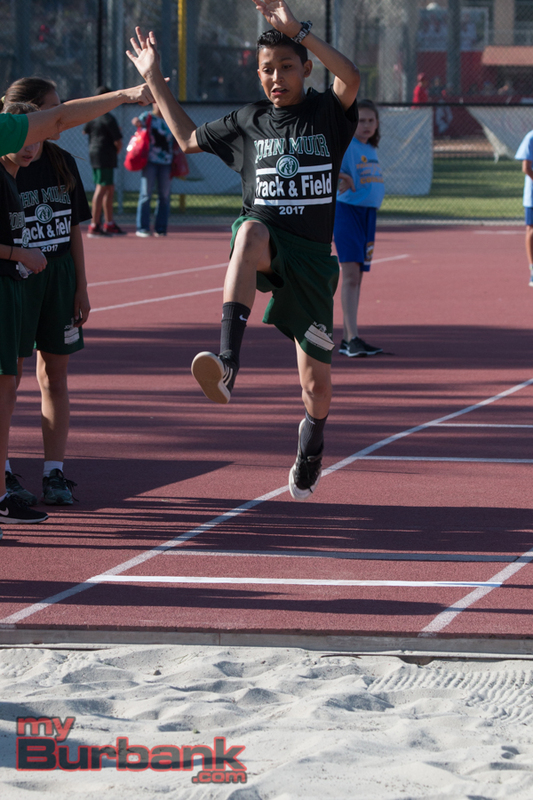 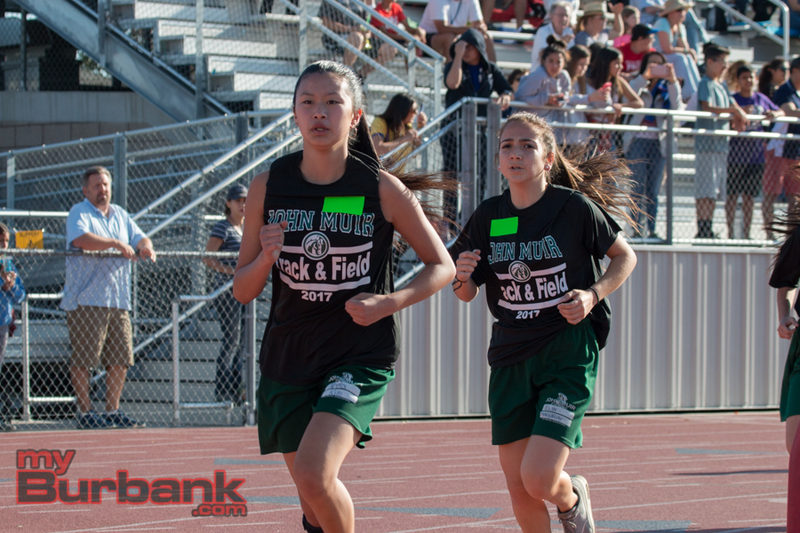 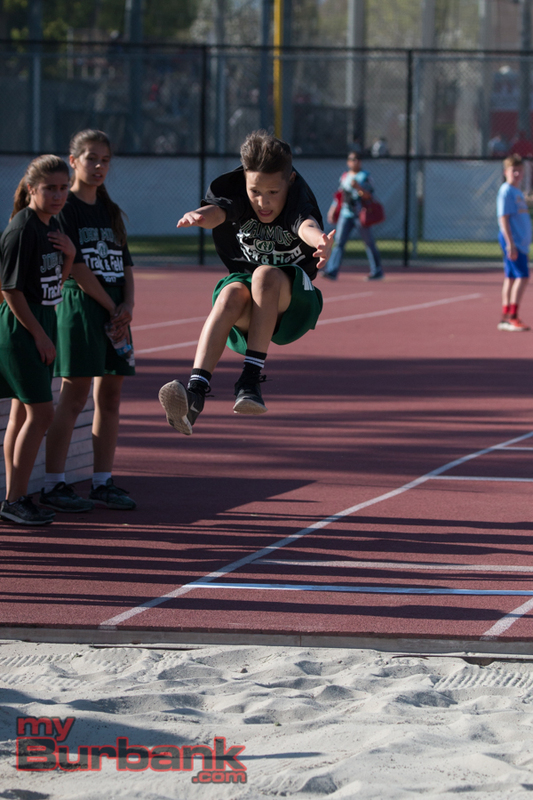 One of the most interesting matchups was in the 6th grade boys’ 400 meters. 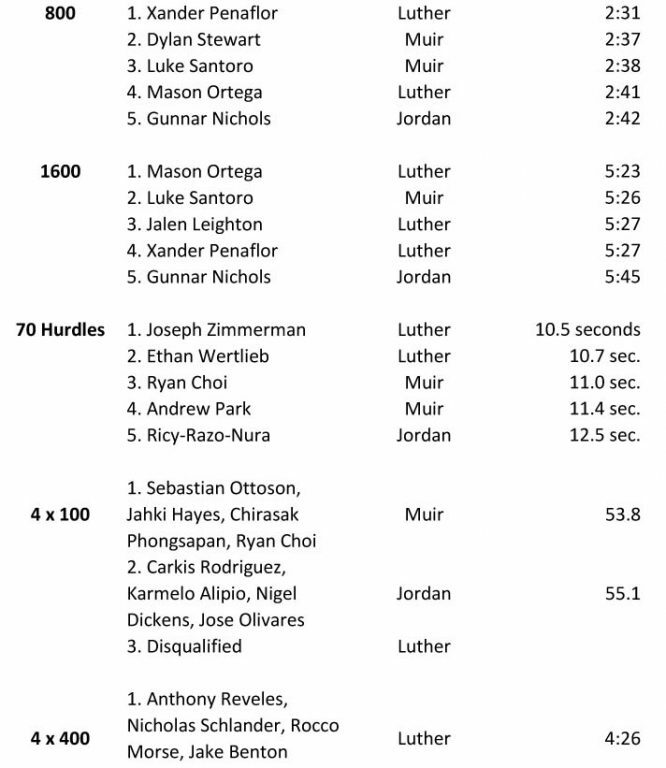 Konner Barrett of Luther matched up against Ryan Dellutri of Jordan. 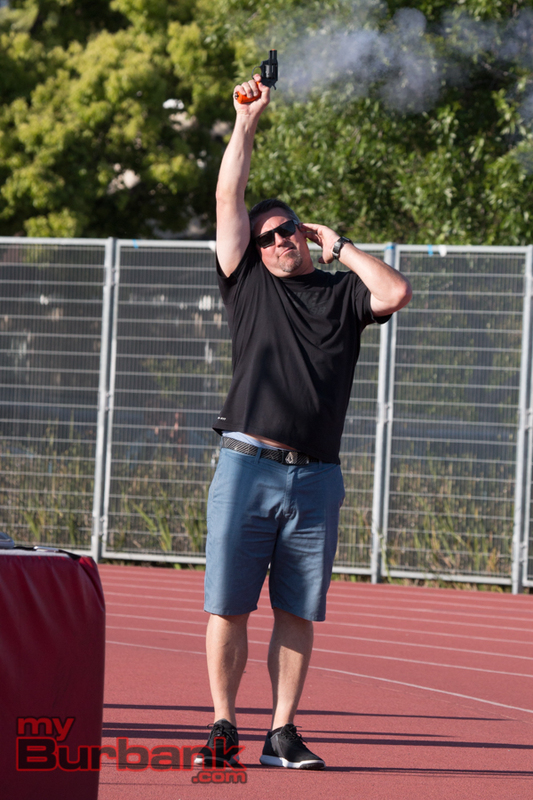 Barrett’s father Jeff was a legendary Burroughs quarterback who later played at Brown University. 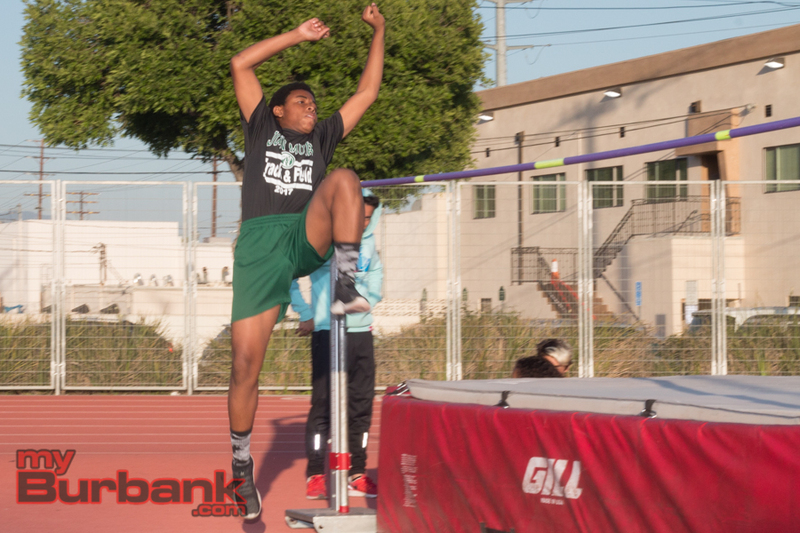 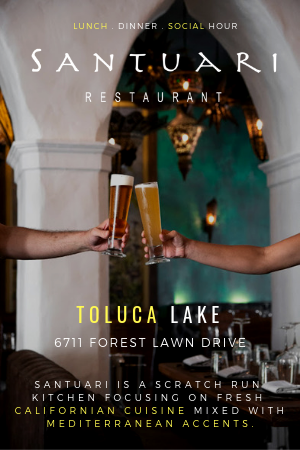 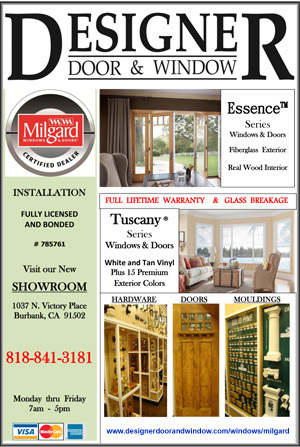 Dellutri’s father Todd was a Burroughs track star and wide receiver, who played football at USC. 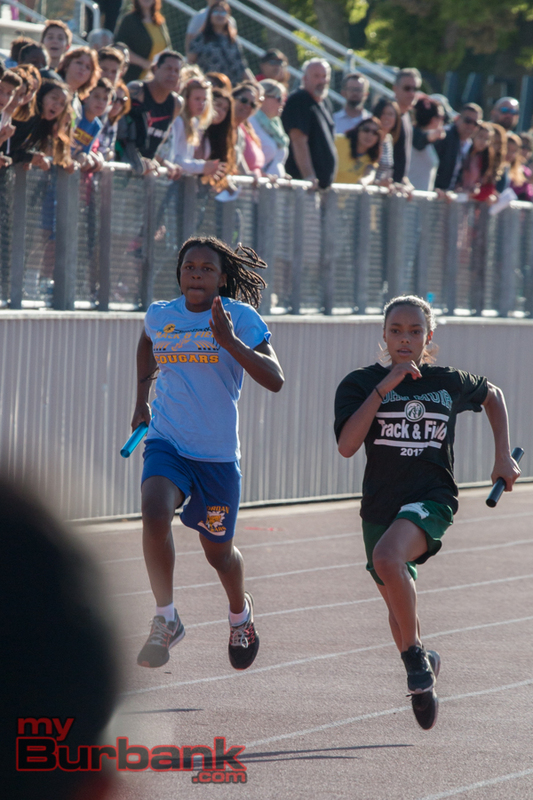 Both destroyed the previous record of 1:03.7. Barrett won in 59.9 seconds. 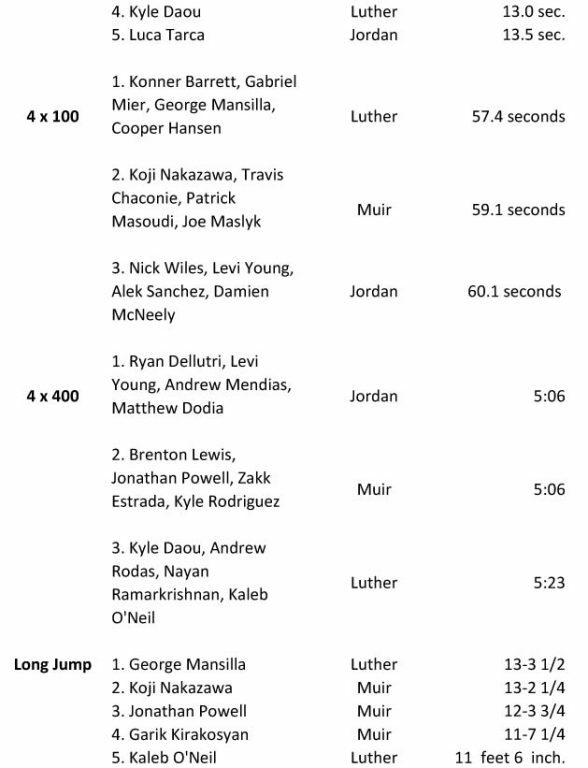 Dellutri was on his tail going 60.2. 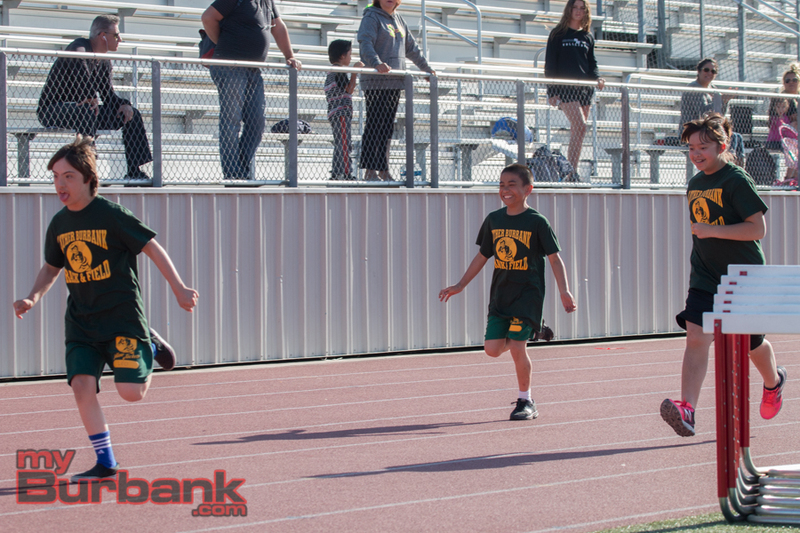 Dellutri will certainly look to top his father’s 56.5 in the 440-yard dash in two years. 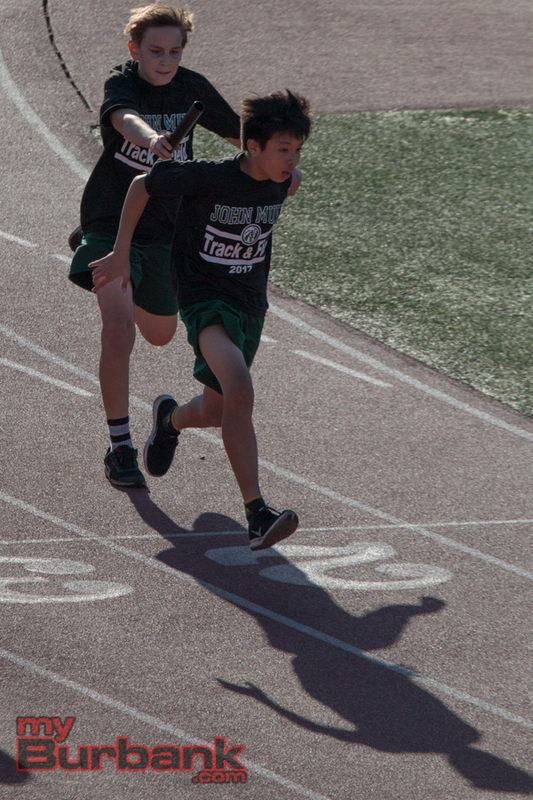 The 400 meters is nearly similar to the 440, which is no longer run. 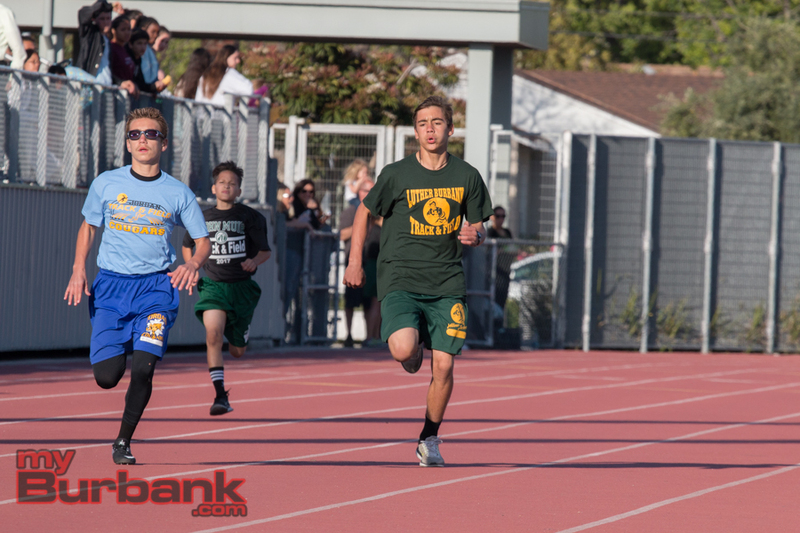 Speaking of meet records, Dellutri set one in the 200 meters by going 27.1. 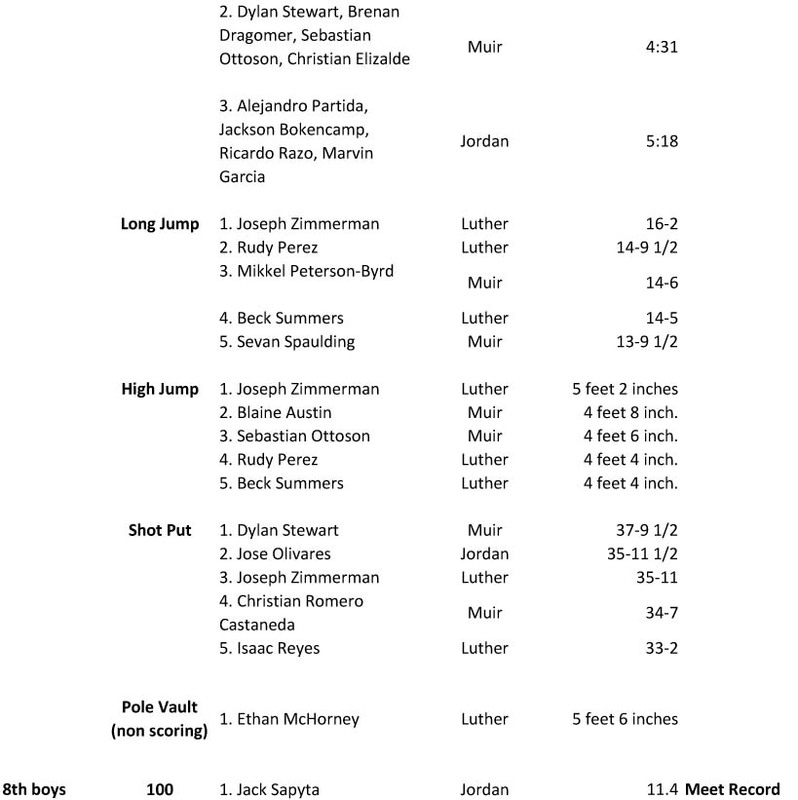 The previous record had been 29.8. 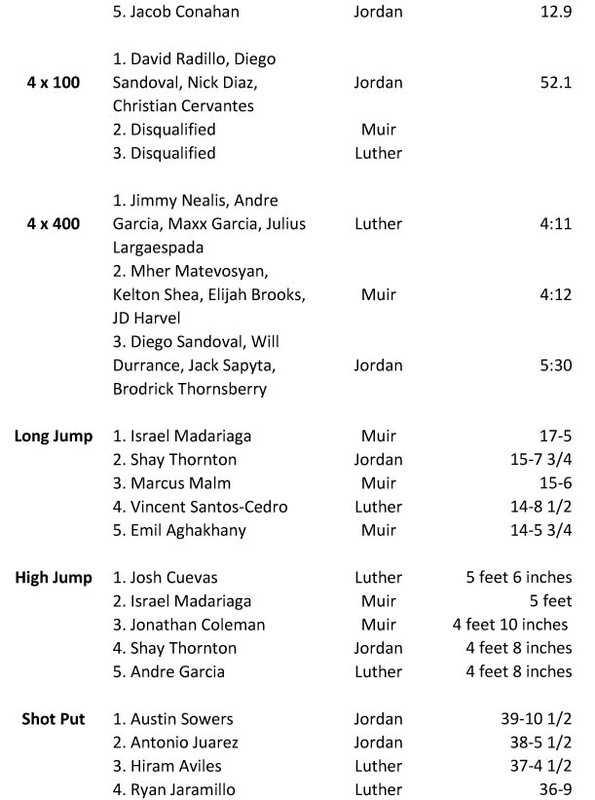 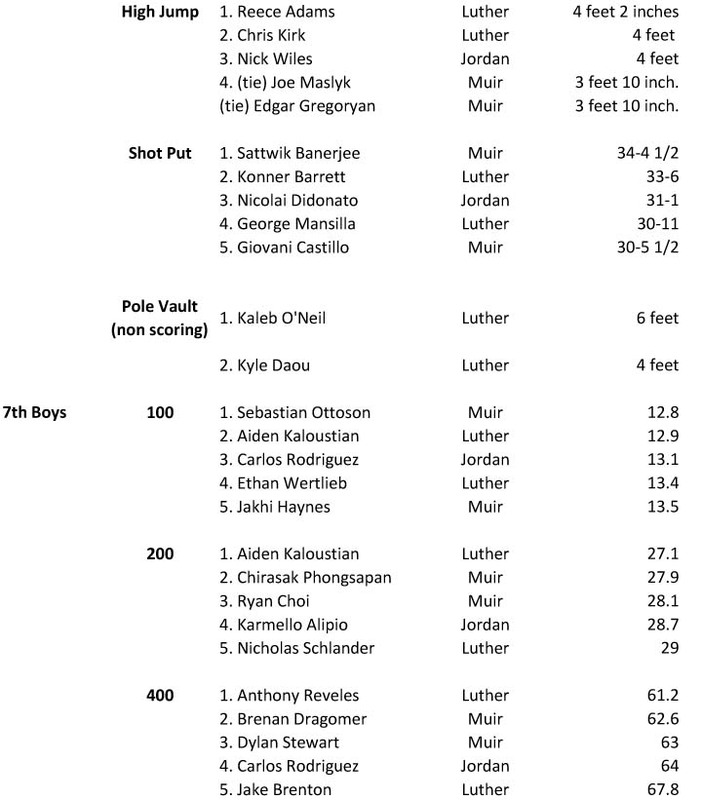 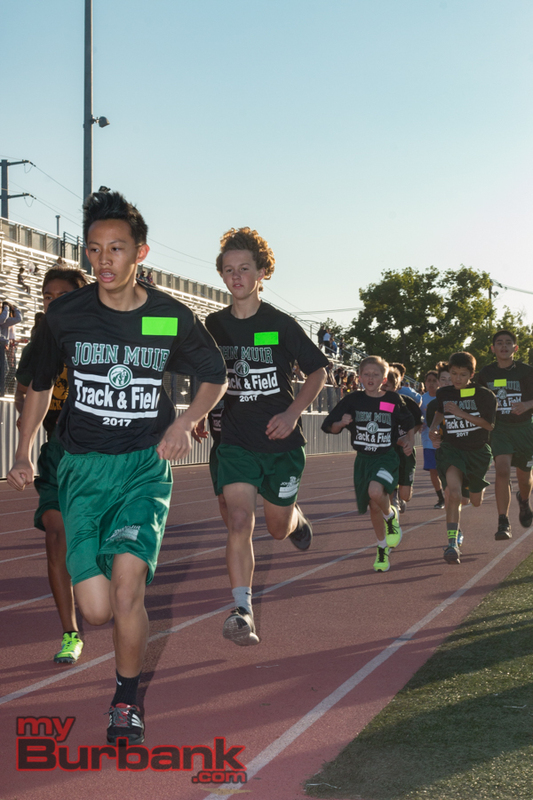 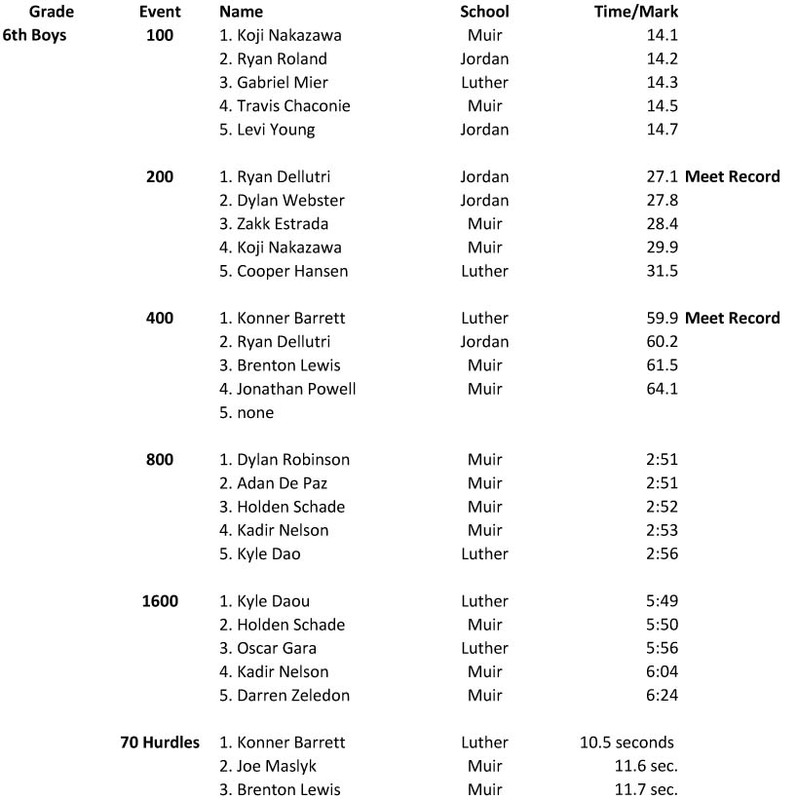 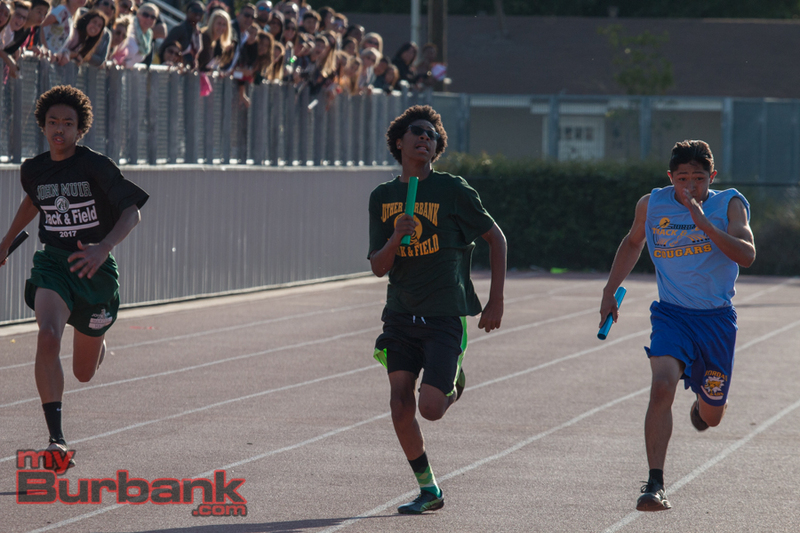 Among 8th grade boys, several records fell, including all three individual sprint events. Jordan’s Jack Sapyta set the meet record in the 100 (11.4) and the 200 (23.6), destroying the previous records of 11.8 and 24.7, respectively. 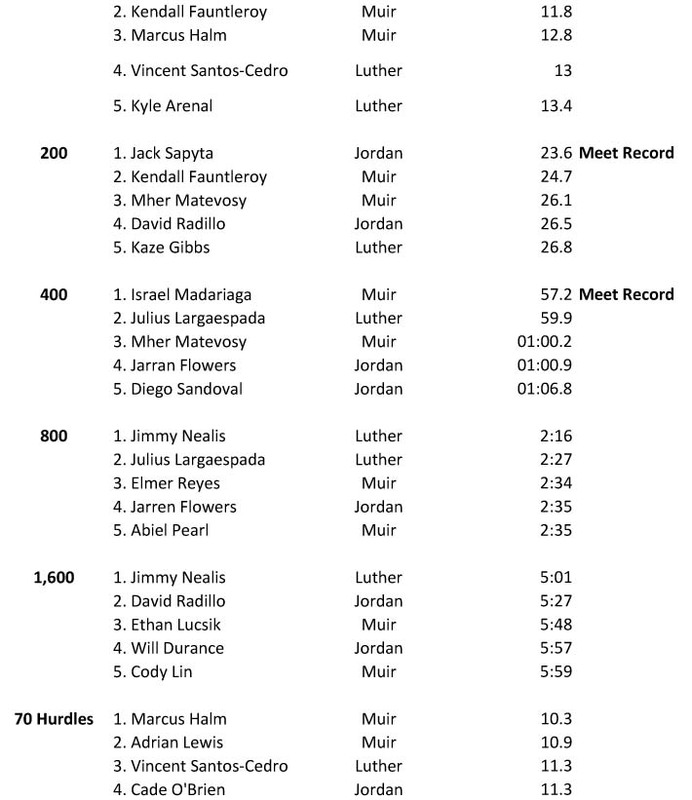 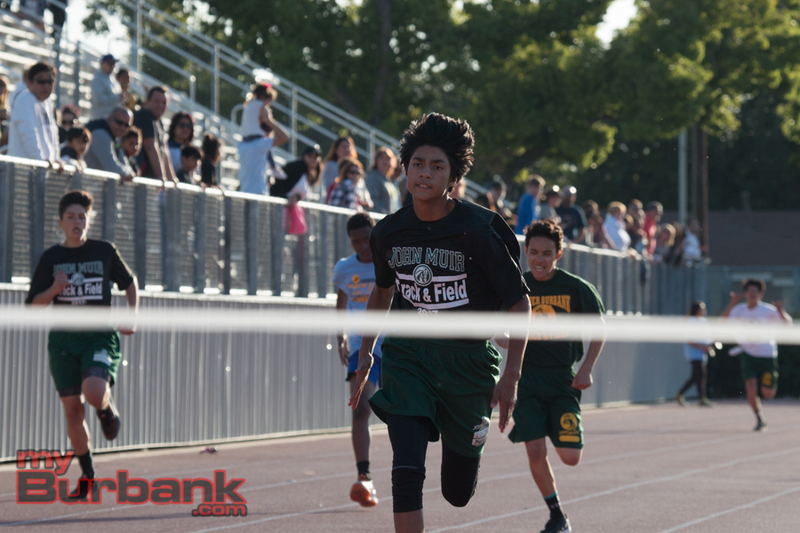 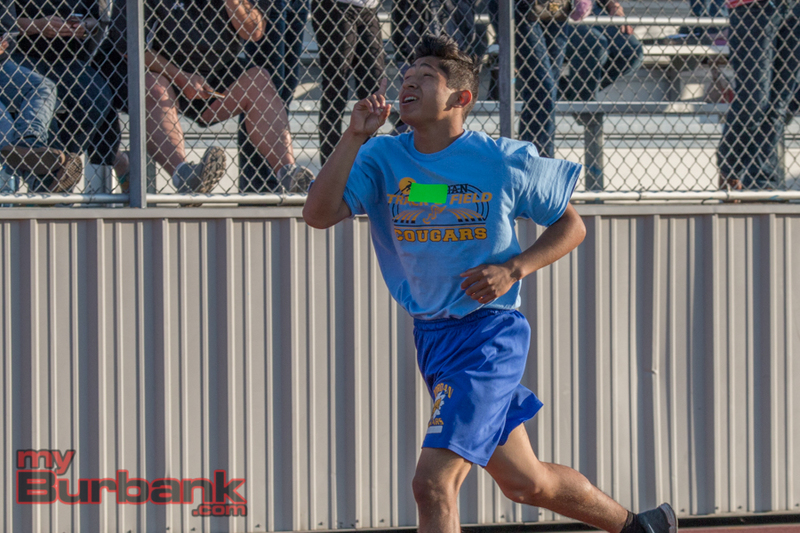 Muir 8th grader Israel Madariaga set the 400 meter record by going 57.2 seconds, breaking the previous record by one tenth of a second. 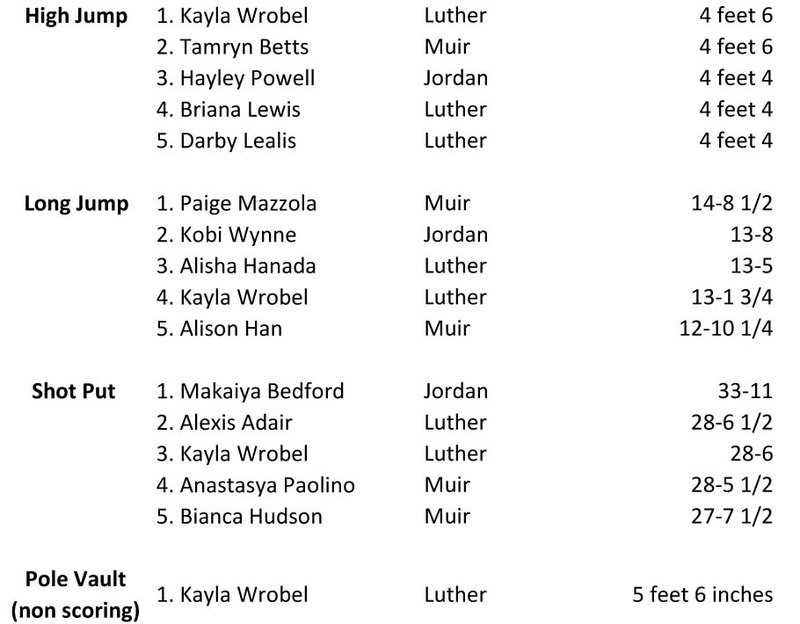 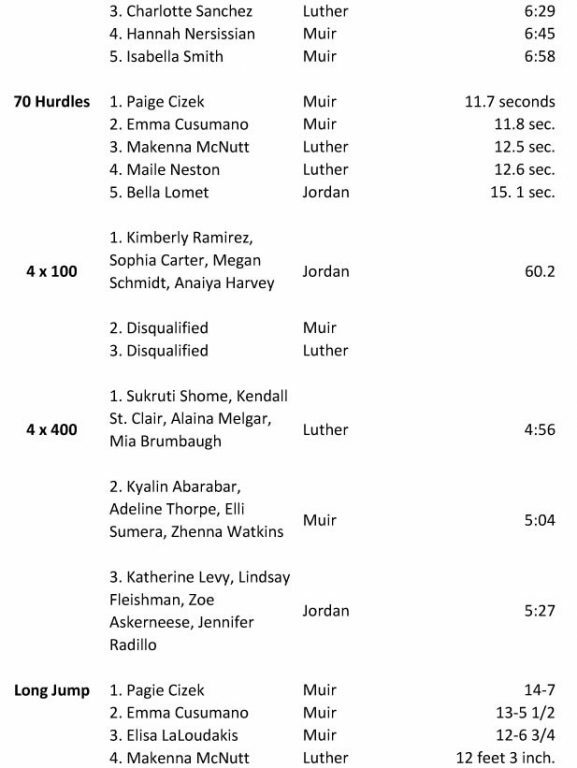 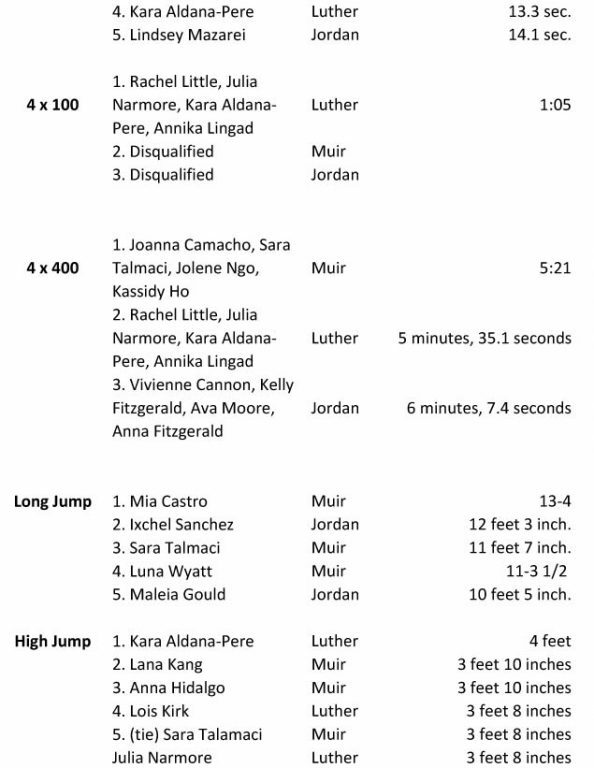 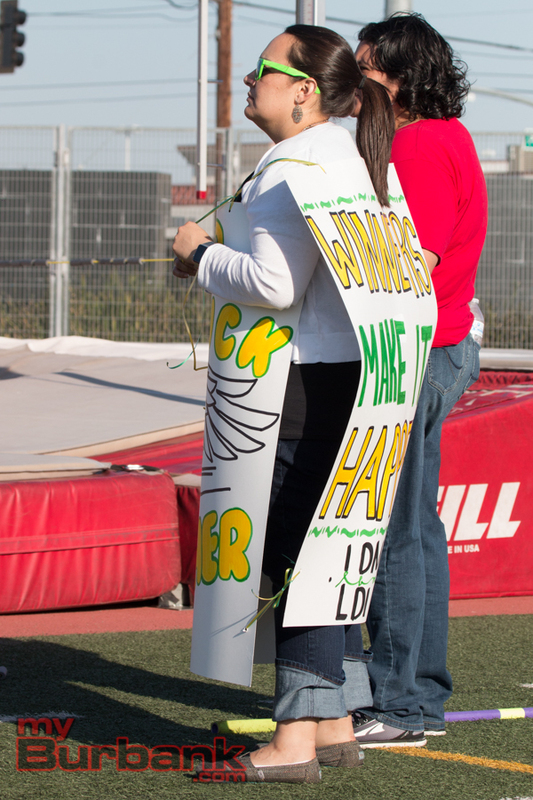 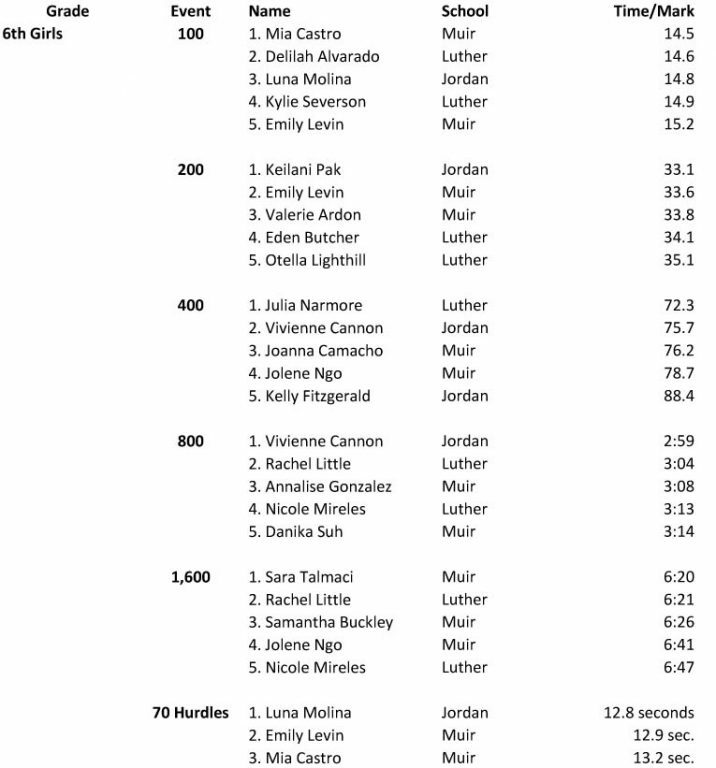 The girls’ competition saw just one record that equaled a meet record. 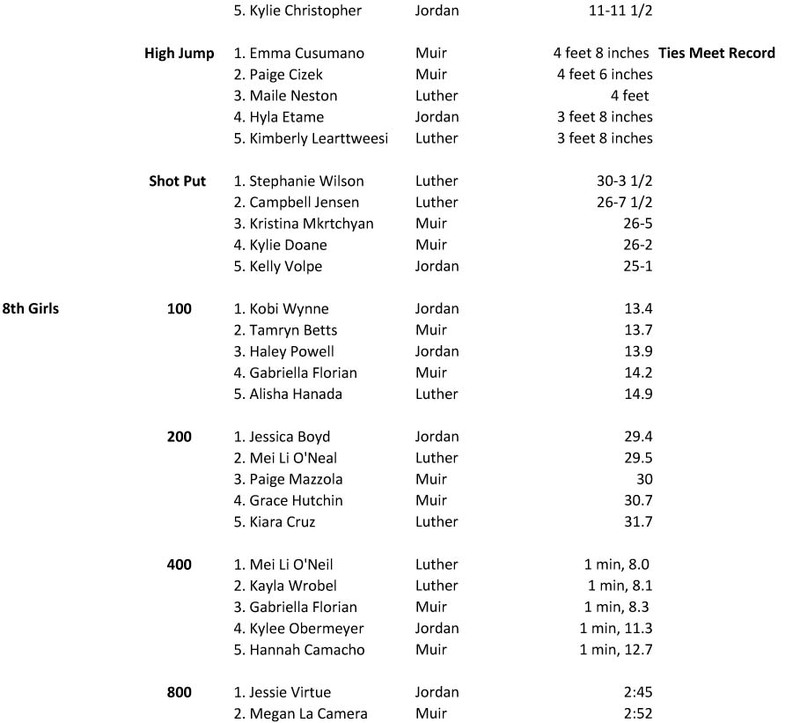 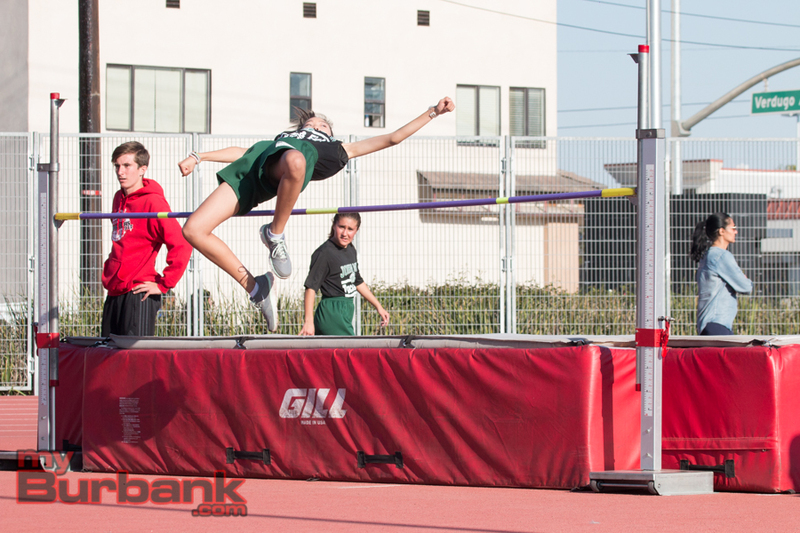 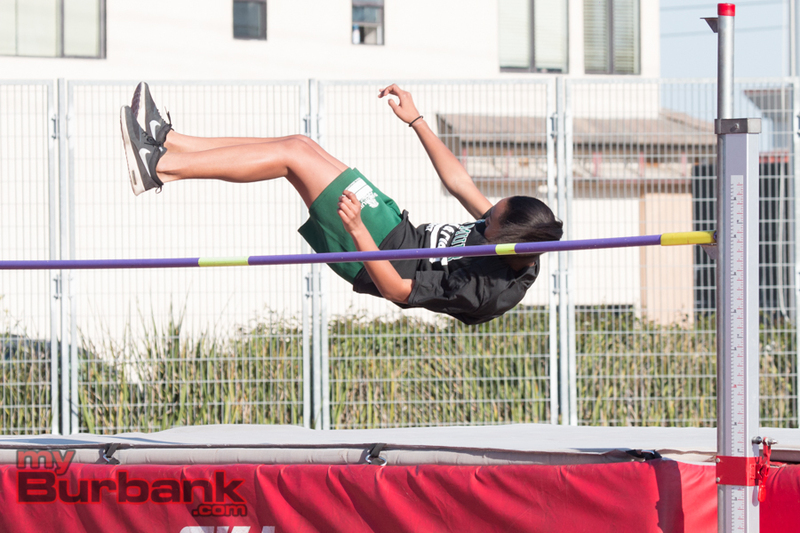 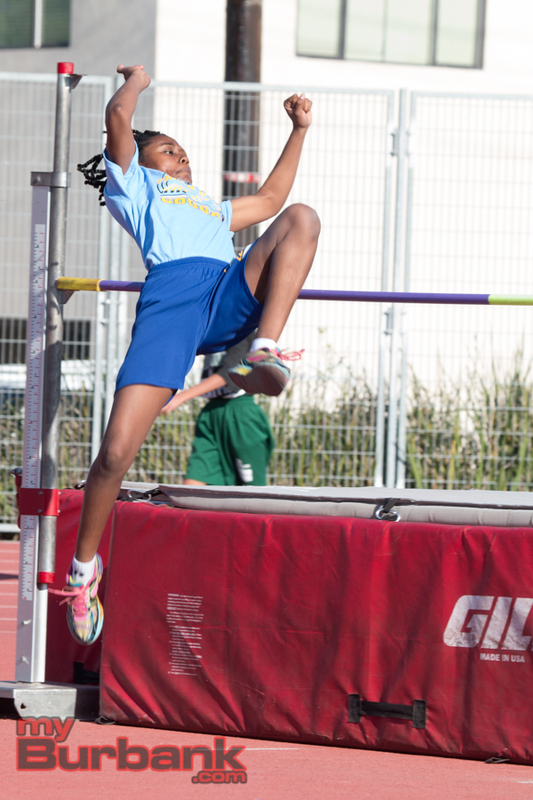 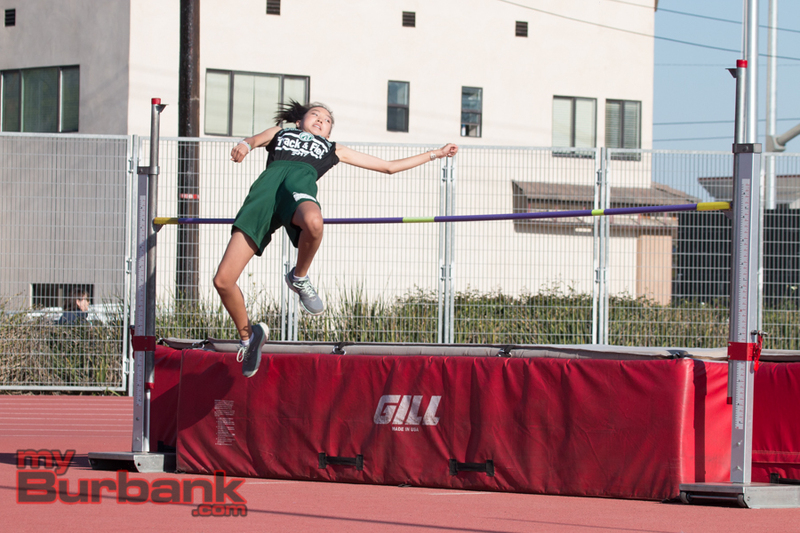 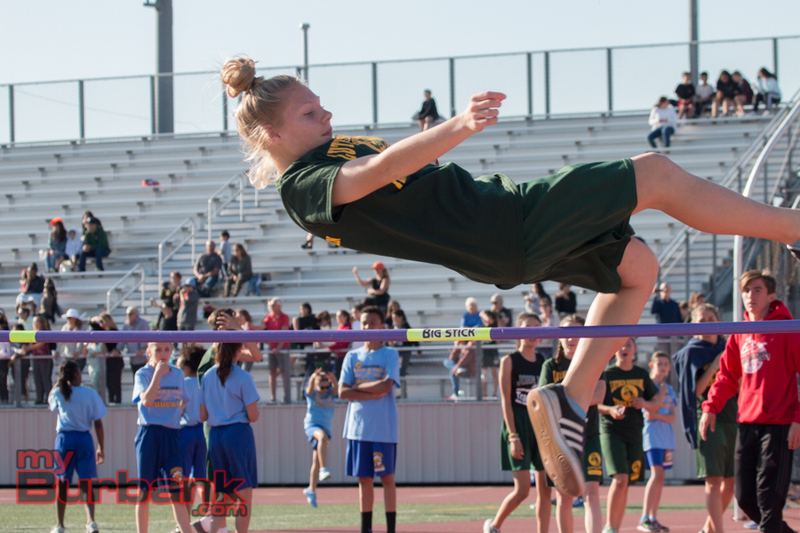 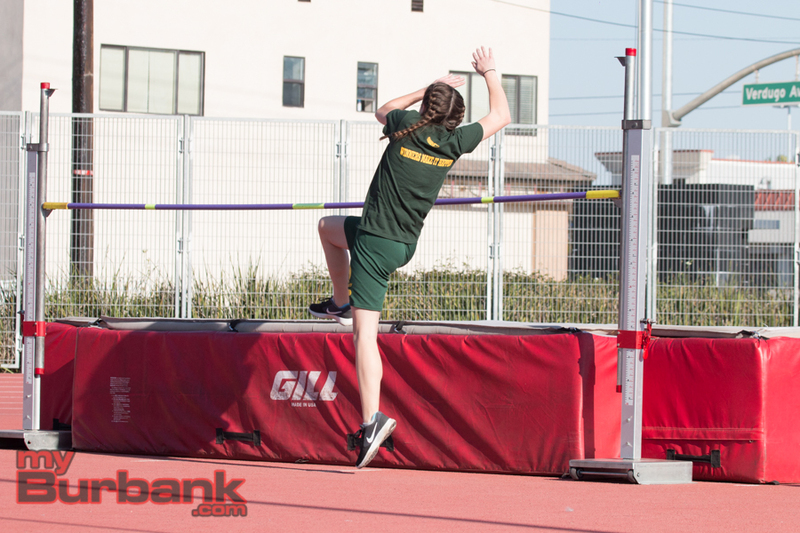 Emma Cusumano tied the meet record in the 7th grade girls’ high jump by going 4 feet, 8 inches. 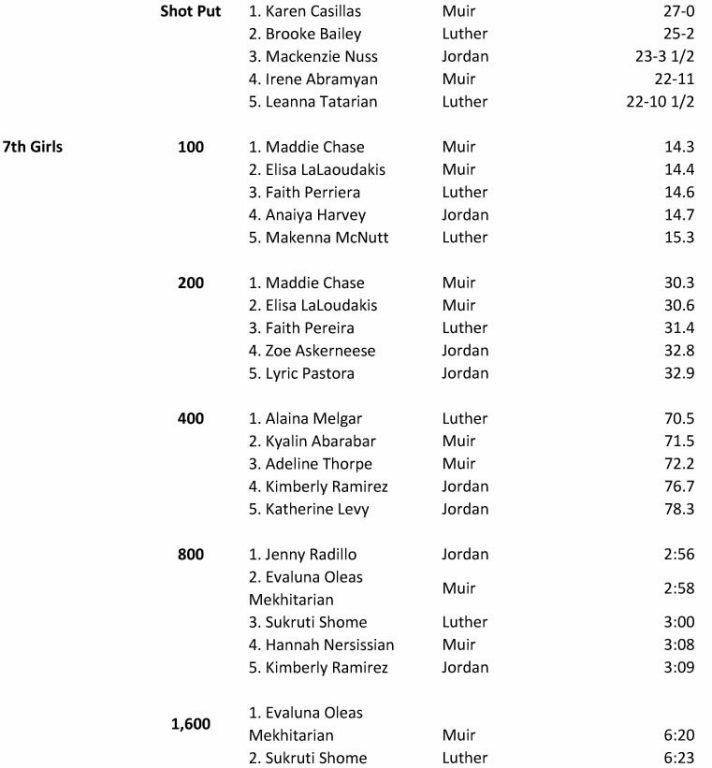 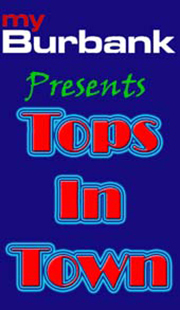 Please see the entire meet results with top five finishers in each race. 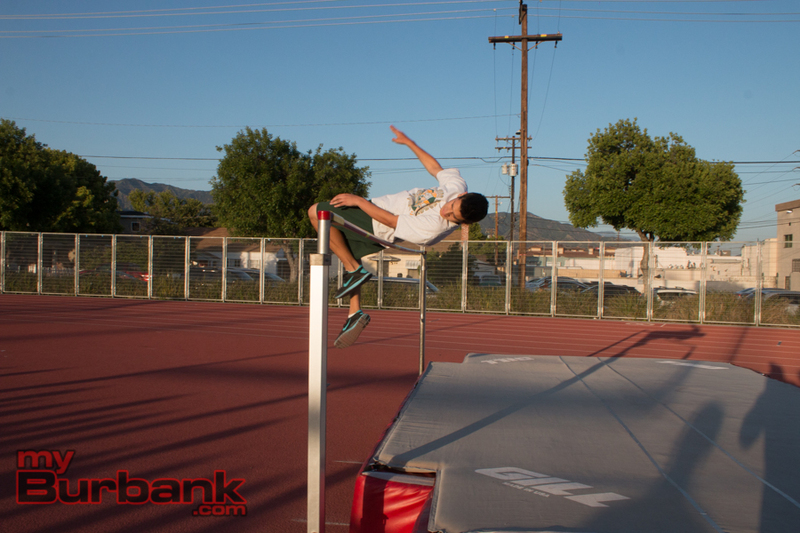 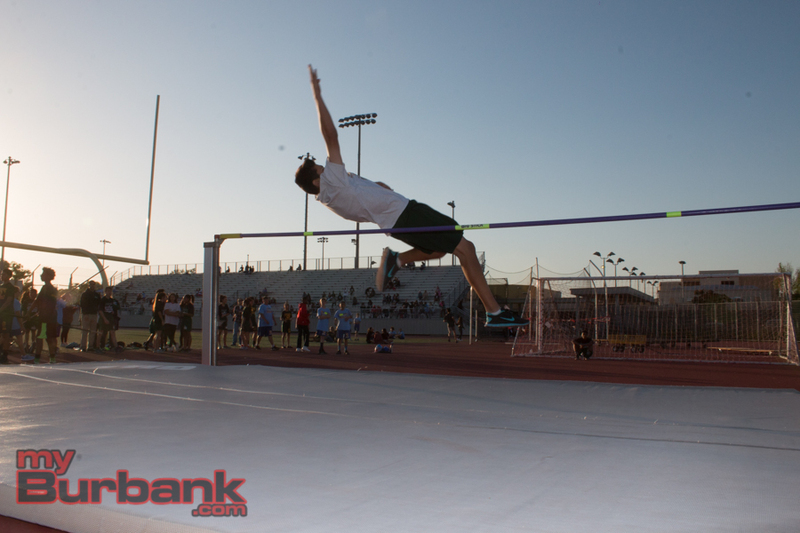 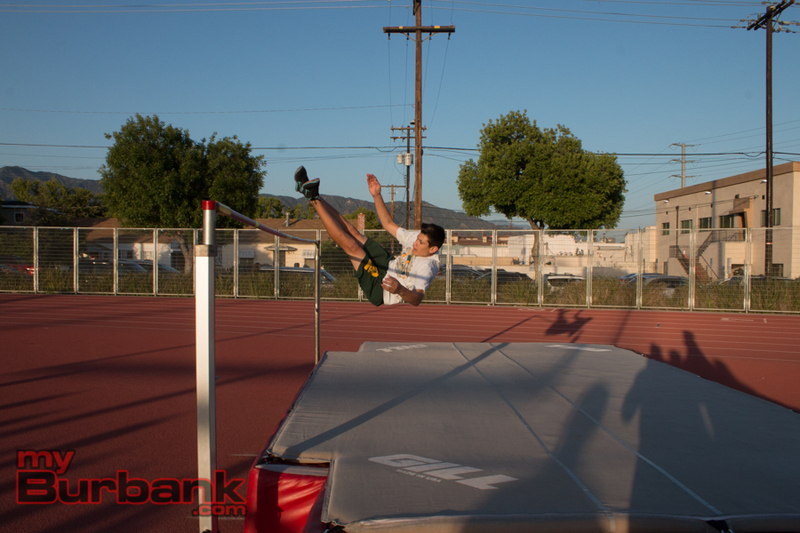 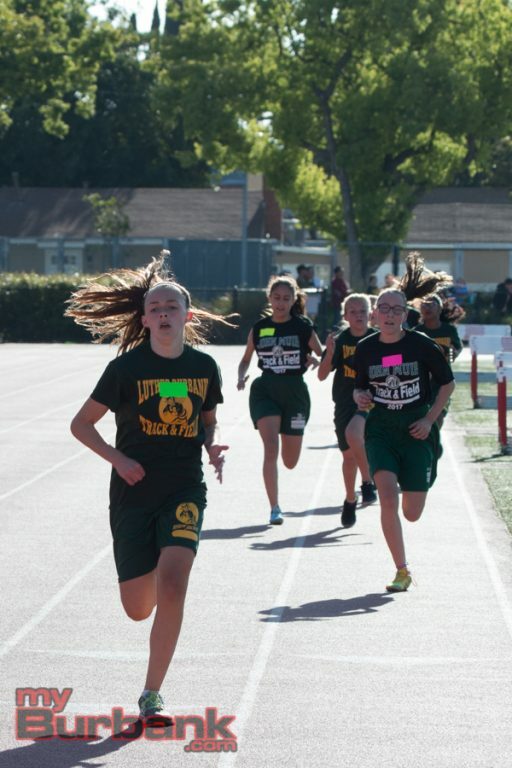 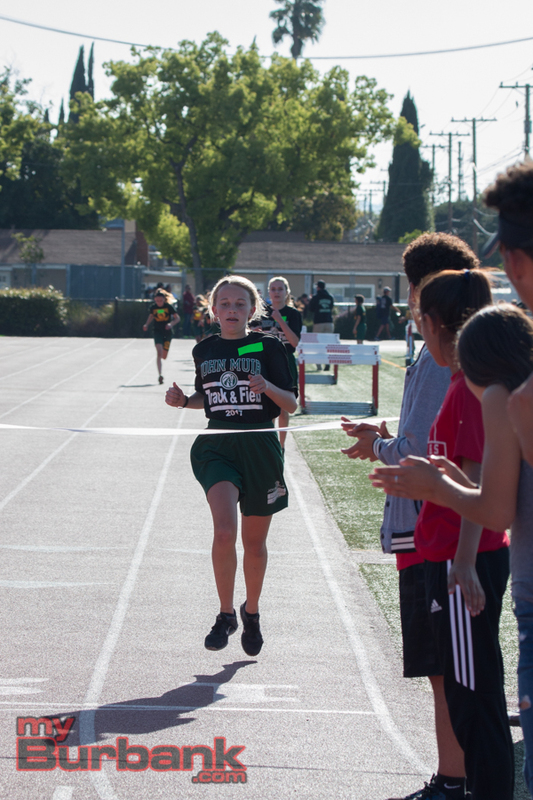 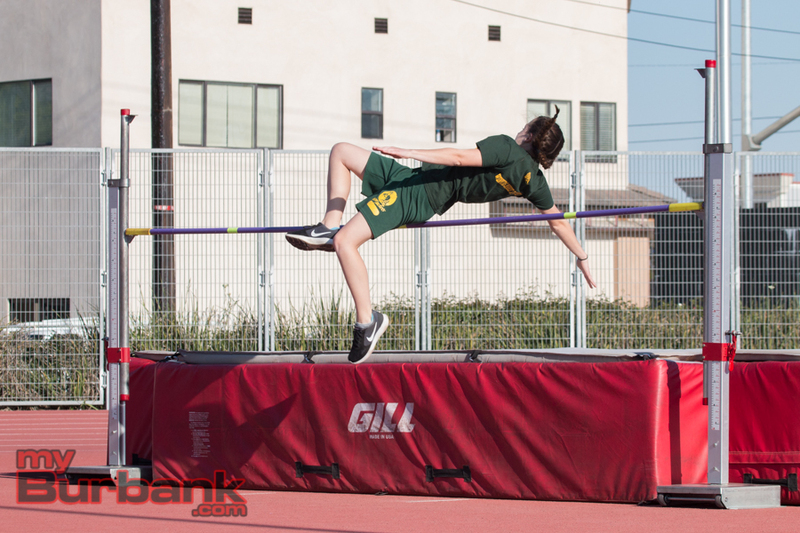 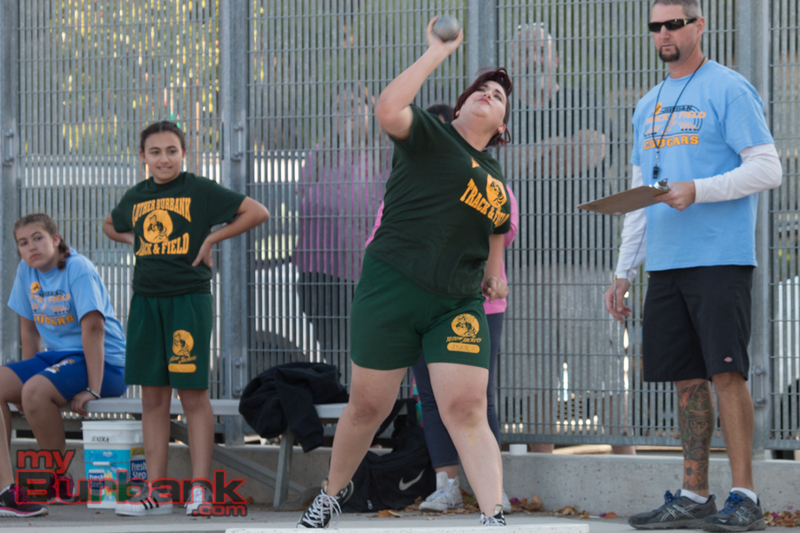 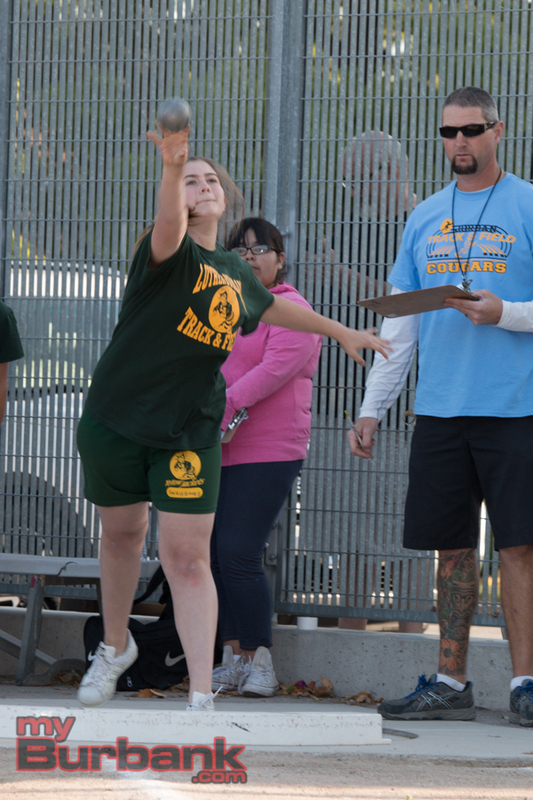 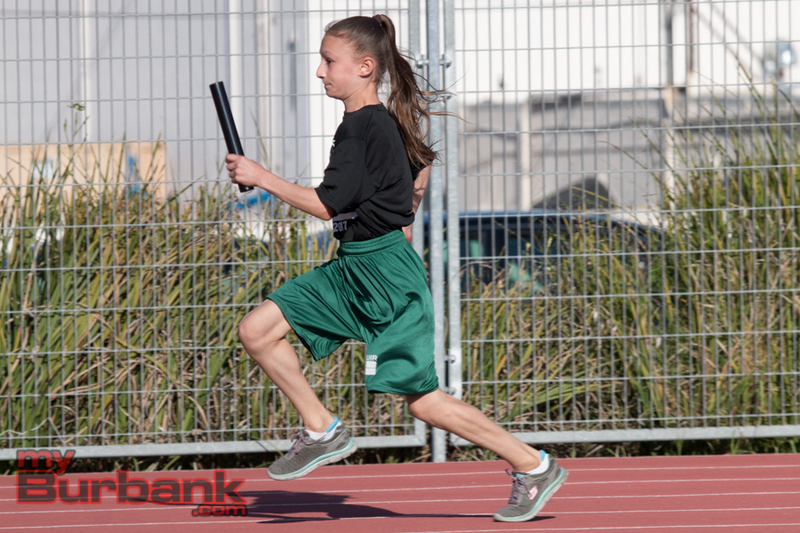 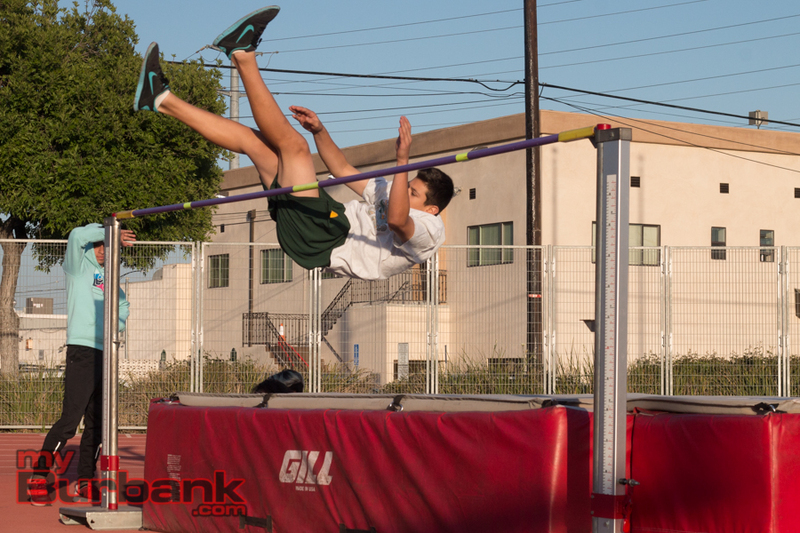 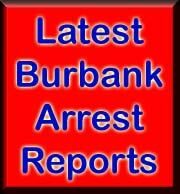 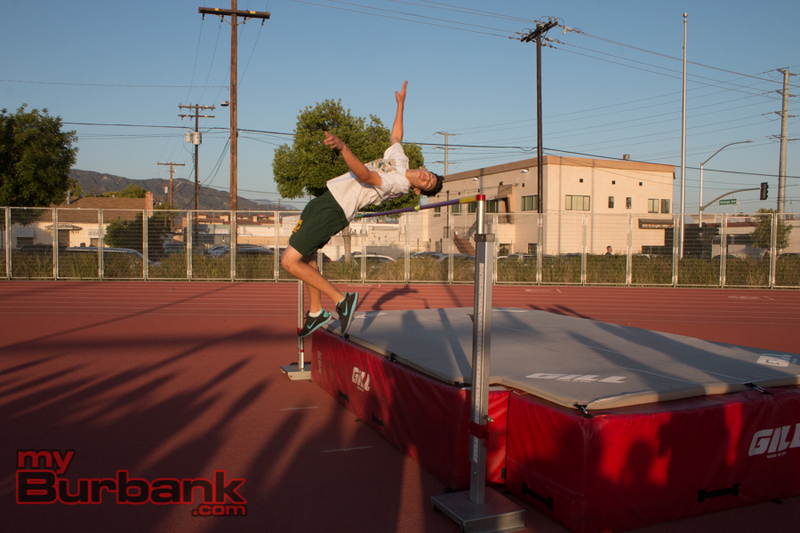 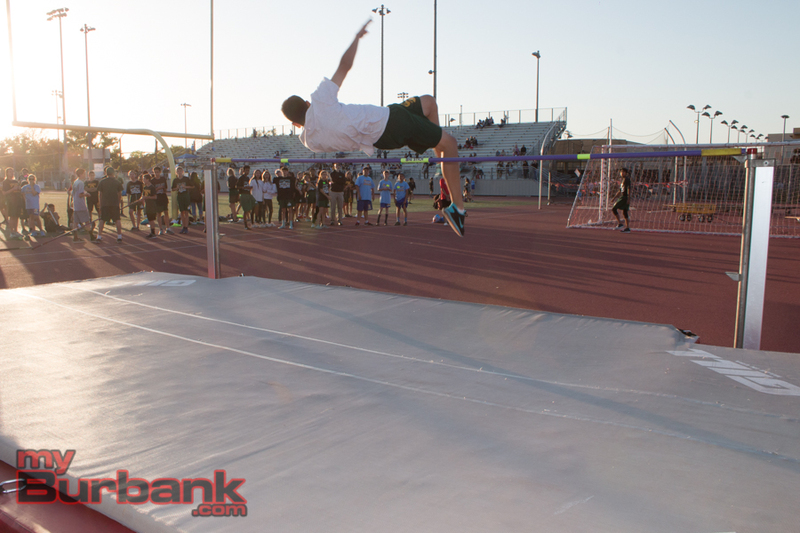 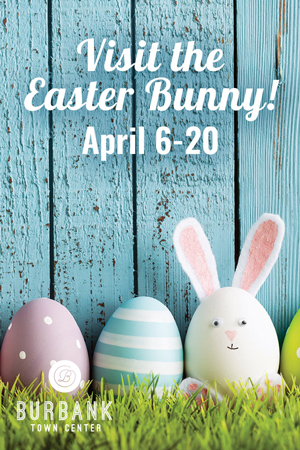 This entry was posted in Sports, Track, Youth Sports and tagged Emma Cusumano, Israel Madariaga, Jack Sapyta, Jordan Middle School, Konner Barrett, Luther Burbank Middle School, Muir Middle School, Ryan Dellutri on April 3, 2017 by Jim Riggio.